Sothink SWF Decompiler for Mac - a professional tool to convert SWF to FLA and extract elements from SWF into variable formats. Banner Maker Pro for Flash 2 - A Flash Banner Maker which can create animated buttons and banners, and make flash banner ads, intros, logos, image ads and other web graphics quickly and easily. Active GIF Creator 2.23 - A powerful Animated GIF Maker which can make animated GIF-files from set of BMP, JPEG, ICO, PCX, TGA, PNG, Adobe Photoshop PSD files, and Windows Metafiles. Animation GIF Wizard 1.20 - A powerful Animation GIF Banner Creator which can make animated GIF banners from your pictures of more than 30 formats including JPG, GIF, WMF, BMP, DIB, PCX, PSD, ICO, TIF, and so on. 2D&3D Animator 1.5 - A 3D animator which can create 3D animations from your own pictures including JPG, GIF, BMP, AVI, ICO and PNG. 3D Flash Animator 4 - Create 3D Flash animations and arcade-style games, and build sophisticated website interfaces. Abrosoft FantaMorph 3.5 - A powerful and easy-to-use morphing software which can create fantastic image morphing pictures and sophisticated animation effects. Animate Me! 1.4 - GIF Maker software to create GIF animations, and make animated AVI-file on the base of predefined effects. Animatricks 2004.4 - A program whihc can create MPEG animations from a single image, such as photo or a drawing. KoolMoves 5.1.7 - A popular web animaton software which can create professional quality Flash movies for web sites. MorphBuster 7.6 - A high performance image morphing software which make you do everything a professional animator does to create morph animations. Sprite Builder 2.0 - A sprite maker which can create sprite, create GIF animation, and create animation for games and other projects. 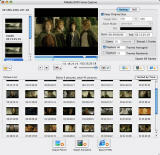 SWF Toolbox 2.7 - Unlock protected SWF file, convert SWF to animated GIF, and convert Macromedia Flash Files (SWF) into standalone projector files (EXE), AVI movies or frame-by-frame JPEG/GIF/BMP image series. Ulead COOL 3D 3.5 - Create animated 3D titles and graphics for output as still images, GIF animation, video or 3D Flash movies. Ulead GIF Animator 5.05 - A powerful animated GIF maker software which can create high impact animation for Web pages, presentations, and multimedia titles. Zoner GIF Animator 5 5.0 - Animated GIF maker software to create and edit images, especially Web banners in the animated GIF format. Advanced GIF Animator 2.22 - A powerful animated GIF maker software which can create animated gif images, edit images and convert GIF to bitmap, GIF to AVI/JPEG file. Effect3D Studio 1.1 - Create professional looking 3D animation graphic, and make 3D text objects easily and quickly. Fun Morph 2.3 - A funny and easy to use photo morphing software which can turn your photo into funny and morphing Movie. It'sMe 2.05 - A 3D character maker which enables you to create astonishing personalized and fully 3D animation characters of yourself, your friends, or anyone from just a single photograph. 3GP to GIF/JPEG Converter 1.0 - A great 3GP to GIF Converter which can convert 3GP to JPEG or GIF formats. MagicViewer 3.5 - A GIF animation program which enables you to make GIF animations, and edit high quality animations to your website and make your photos look better and unique. quick3D Professional 4.0 - A powerful 3D file converter that can view lots of formats of 3D file and convert 3D files. Realview 3D 2.6 - A toolkit which can create animations from GIF BMP JPG AVI for your own website. Rotor 3D Viewer 1.3 - A 3D model viewer which quickly generates a high-quality display of your 3D models, and create 3D presentation with unlimited slides. Virtual Flower 1.2 - Create flowers and geometrical patterns in 3D and make animation frames or flash movie. Artoonix 1.5 - A powerful cartoon maker which can create cmputer animated movies or cartoons on your PC. Magic ASCII Studio 2.2 - A powerful ASCII Art generator which enbles you to make ASCII Art Animations, ASCII Art Words and ASCII Art Photos. Atani 3.7.6 - An easy-to-use animated GIF maker which can create animated AVI file and GIF animations. FaceMorpher Multi 2.0 - A morphing program which can create funny face animations. Extra GIF Animator 1.0 - An easy-to-use GIF animation maker software which can creates a computer GIF animation in minutes for the Web. Flying PopCorn POP 6.0 - A multimedia Contents Authoring Tool which can create web contents and CD-ROM titles for promotion, presentation, education and albums. Algolab Photo Vector 2.97.37 - A Raster to Vector Conversion software which converts architect, mechanical and various technical drawings, maps and other types of line artwork from raster to vector formats. Funny Morph Maker 5.58 -Funny Morph Maker is funny and easy to use photo morphing and warping software. Morph and warp face or image of friends, family, celebrities. Turn them into a cat or a pig or any jokes! FX Morph 2.03 - Picture morphing software transforms one person or object into another before your eyes! It supports BMP, JPEG, TIFF, PNG, GIF, TGA, PCX formats and exports morphing picture to AVI, Animated GIF, Flash. Easy Gif Maker 1.8 - Make GIF animation quickly and effectively. Wheather you are creating animations for the Web or other application, Easy GIF Maker is necessary for you. You can convert BM, TGA, JPEG, PNG, ICO image series to GIF file.